The Flower Bulb Region is best known for the colourful tulip fields in spring and of course the Keukenhof. 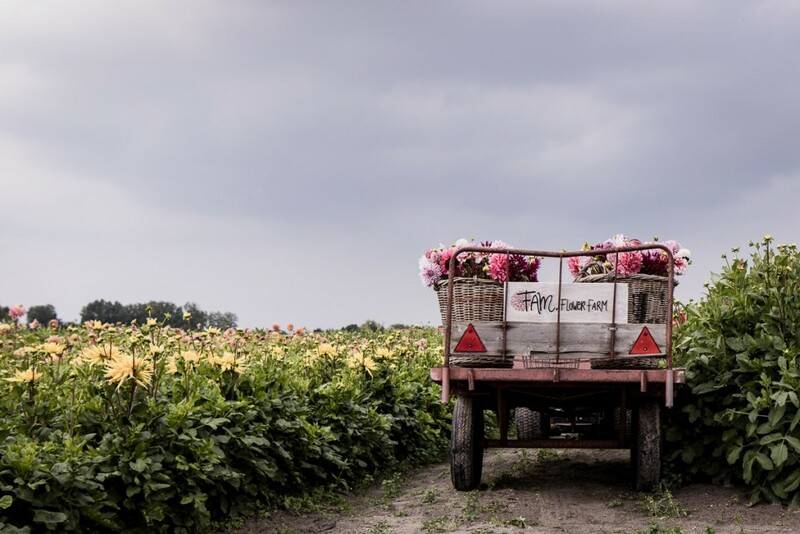 What few people know is that there are also flower farmers in this region growing dahlias. 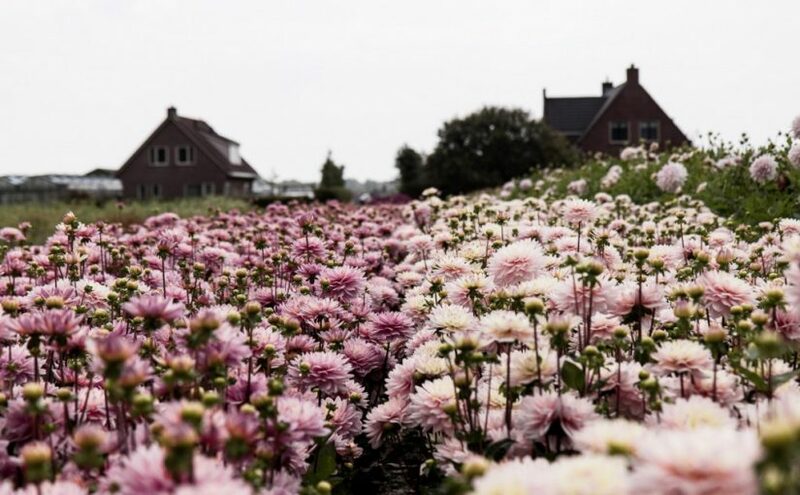 Both Sinie and I are huge dahlia fans so when Linda and Marlies invited us to see the dahlia fields in bloom, we didn’t hesitate for a minute. And we weren’t disappointed! The dahlia fields aren’t visible from the road. All we saw when we drove to the FAM Flower Farm were empty tulip fields. Linda and Marlies sent us a detailed description how to get to their farm. 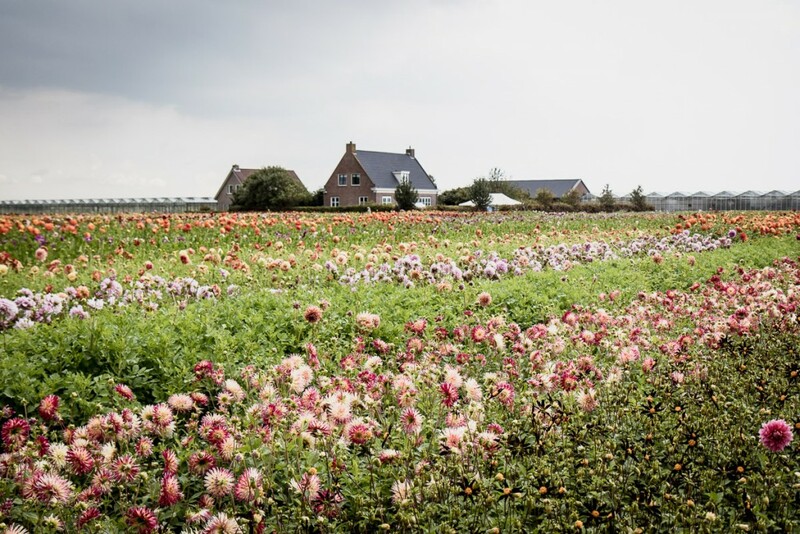 When we finally reached the dahlia fields, we were speechless. So many dahlias! So many colours! We enjoyed a warm welcome and great hospitality by our hostesses. There was coffee and cake, and we were invited to stay for lunch. Linda and Marlies have been friends since high school. They both married a flower farmer and have started FAM Flower Farm together. During lunch, Marlies’ husband explained to us how they grow dahlias. 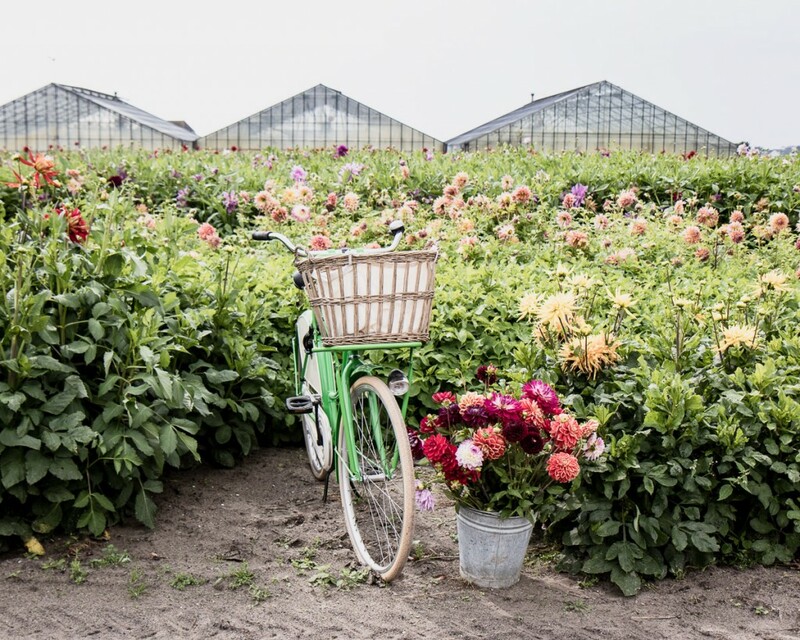 Many people expect the flowers in the field to be cut and sold, but most dahlia growers produce and sell tubers. The season begins in early spring. Dahlia tubers are potted up in a greenhouse. After the potted tuber starts sprouting and the shoots are large enough they take leaf cuttings. 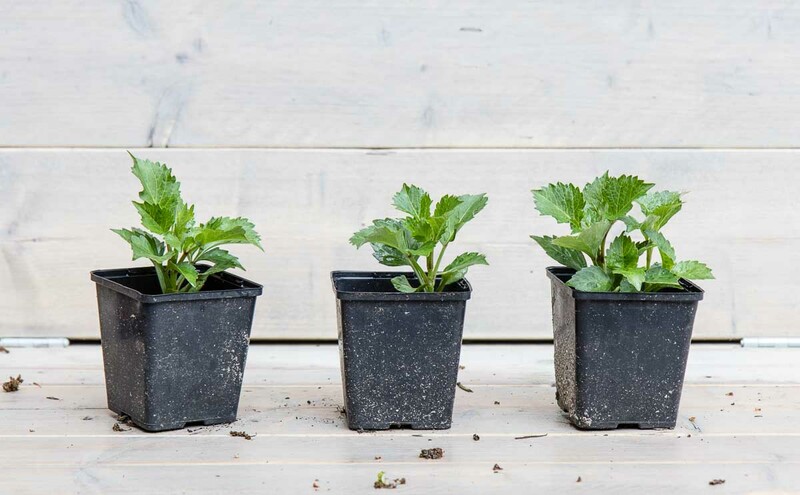 The cuttings are planted in soil and start rooting. When the cuttings are big enough they plant them out in the field. The plants grow all summer to produce tubers. Each cutting, if grown properly for a full season in the field, will produce several tubers that can be dug up in autumn. Each variety is planted together. The fields are carefully observed. A field of, for instance, Vassios Meggos shouldn’t have other flowers in it. When the farmer spots a flower that doesn’t look like Vassios Meggos, they pull it out, tuber and all. When customers buy a Vassios Meggos tuber, they expect a Vassios Meggos flower! Right about now the farmer starts mowing the flower fields. Can you imagine? Cutting off all those beautiful blooms! What is left is a field of short plants. The tubers stay in the ground for another month or two. When they no longer produce flowers, all the energy of the plant will go into the tuber. The tubers are harvested before the first frost. In late October and November, they dig up the dahlia tubers. The tubers are cleaned, allowed to dry and stored for winter. Ready to be delivered to your home in spring 2018! 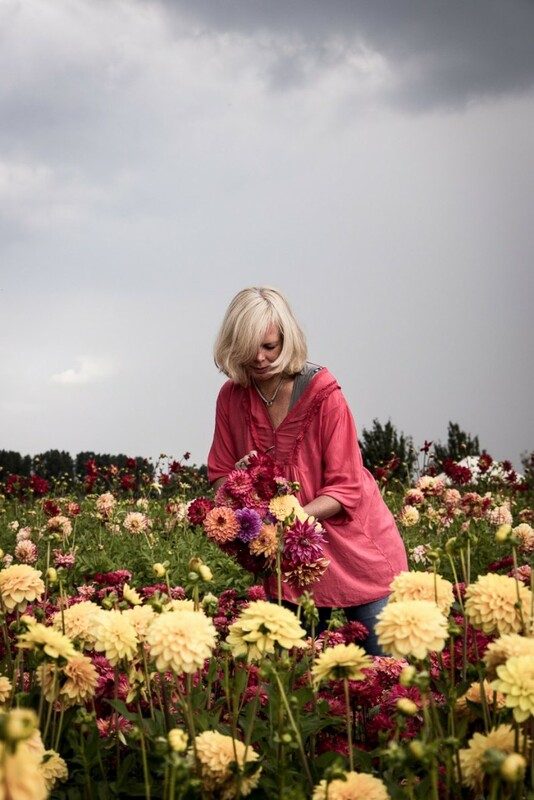 I did a little interview with Linda and Marlies, so if you want to learn more about their family flower farm and the dahlias they grow, read on. Linda: the tulip! And preferably a field full of tulips behind our home. Pure, simple and typically Dutch. My favourite tulip is ‘Flashpoint’. This gorgeous pink tulip is double bloomed and changes colour after being cut. 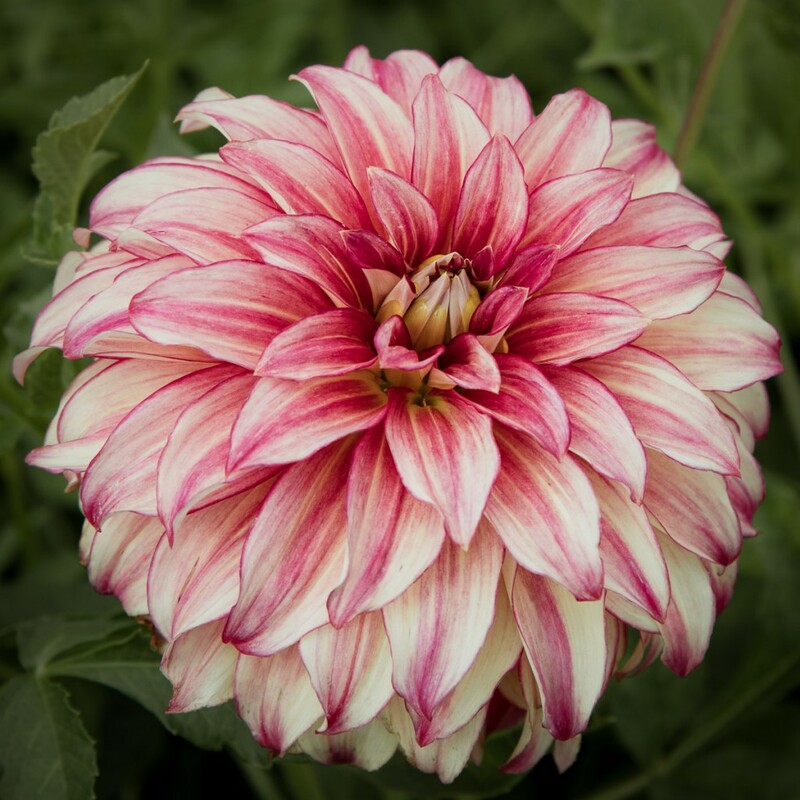 Marlies: the dahlia! How could it be otherwise when there are so many colours, shapes and sizes of dahlias. I always have flowers in the house and always a different kind of arrangement. Sometimes a few blooms in a simple bottle or little vase can make all the difference. My favourite dahlia is Miracle Princess. This soft pink bloomer was named after our sweet niece Miracle. She likes to dress up as a princess and she loves pink! Dahlia grower Marlies. Soon after this picture was taken it started pouring rain. We were soaked within minutes! It was quite funny. How many dahlias do you grow? 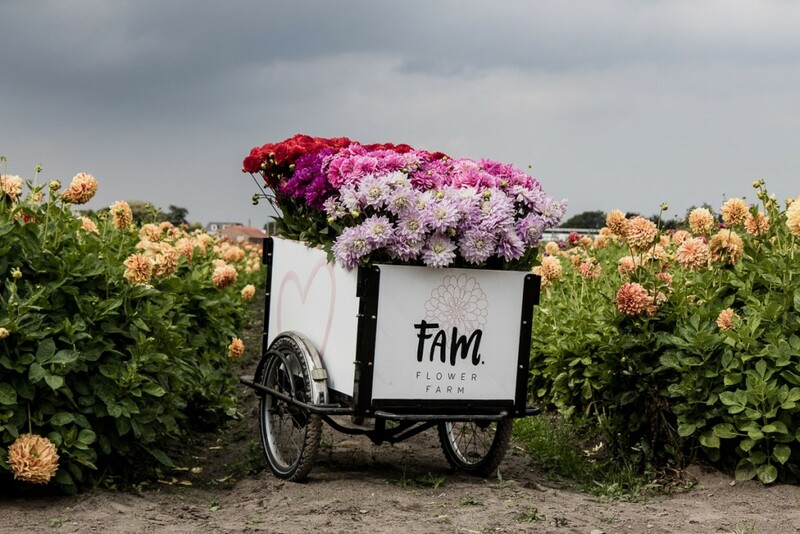 FAM Flower Farm: We grow about 180 different varieties. We specialize in exclusive dahlia varieties. We mainly grow dahlias for tuber production but we do have a small field of cut flowers varieties (Sylvia, Lilac Bull, Red Cap, White Onesta and Nagano). During blooming season, August and September, we sell our flowers at the flower auction. How do you choose the varieties you grow? FAM Flower Farm: We sell most of our tubers to suppliers, traders and exporters. We ask them what they are looking for. We also follow our own instincts but it is not easy to predict what the public will want in their garden a few years from now. That’s why we love to share our flowers on Instagram and Facebook. We love hearing directly from you! 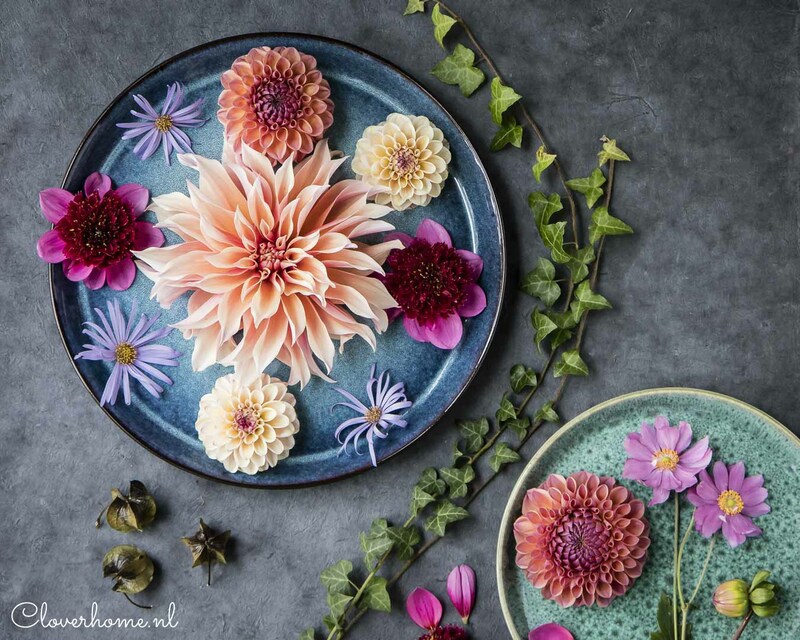 What are the most popular dahlia varieties? 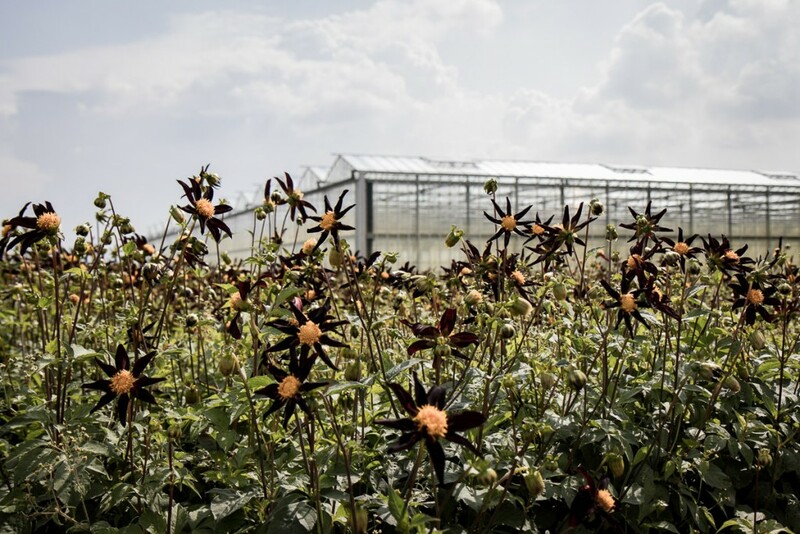 FAM Flower Farm: Our American customers like the large dinnerplate dahlias such as Lady Darlene and Vassio Meggos. 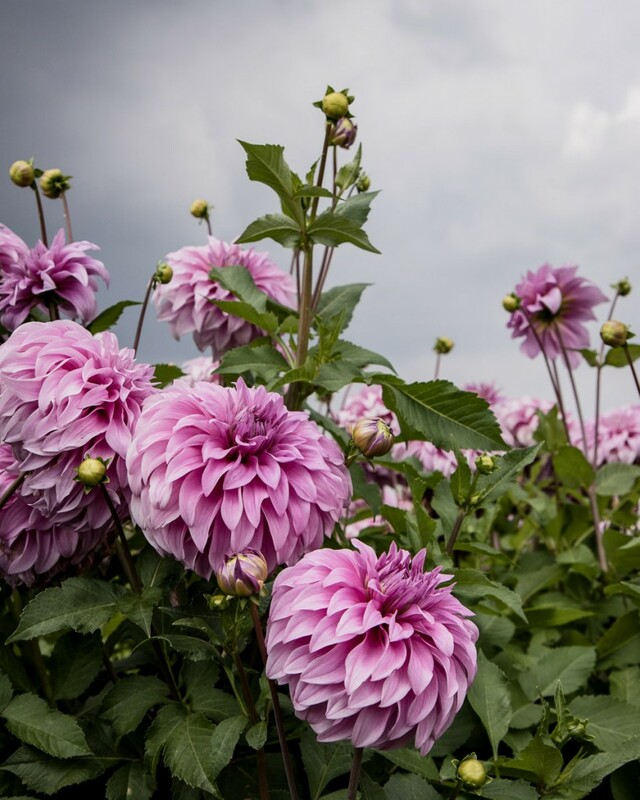 The low growing dahlias with lots of flowers such as Pink Magic, Diana’s Memory, Berliner Orange and Princess Miracle are very popular in Europe. Do you breed your own dahlia varieties? FAM Flower Farm: Sometimes we find a different flower in the field that looks promising. We harvest the tuber separately and plant it next spring to see what comes up. Each year we buy a few new varieties from dahlia breeders. Sometimes just one or two tubers. We grow these varieties for 3 years to see if all flowers are equally beautiful. If so, we will start increasing our stock until we have enough tubers to sell. Do you have any advice for people who want to grow their own dahlias? FAM Flower Farm: Just do it! Buy a few tubers and plant them in spring. When they are flowering in summer, don’t be afraid to cut a few flowers for the house or to give to a friend. The more you cut them, the more they bloom. I love my dahlias but it’s such a shame they often last only a few days. Do you have any advice on the best way to keep them fresh longer? FAM Flower Farm: First of all, vase life depends on the variety you grow. Cut flower dahlias have a longer vase life than some garden varieties. So if you are growing dahlias, make sure to include some cut flower varieties. Pauline: good advice! I grow lots of cut flower varieties, you may find my thoughts on planning a dahlia garden part 1 and part 2 interesting. Always start with a clean vase. If you want, you can add a drop of bleach to keep the water clear of bacteria. We don’t really use flower food. When harvesting flowers straight from the garden, it’s not necessary to recut them. 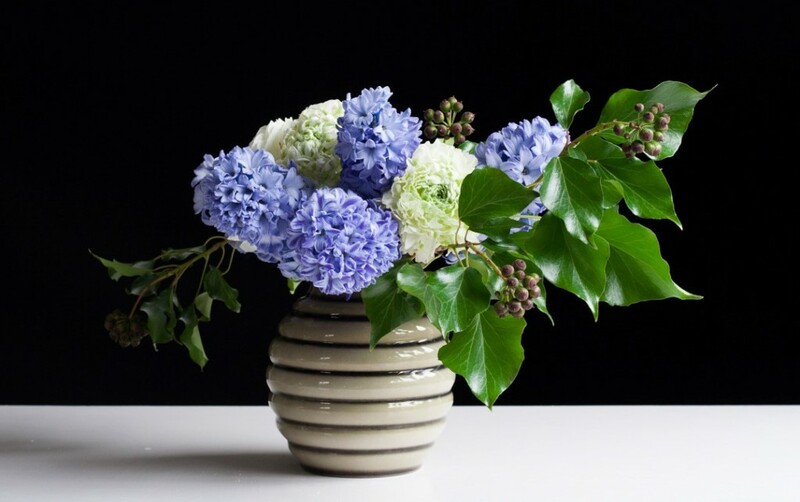 If the stems have been left out of water, even for a short period of time, it’s a good idea to recut the stems at an angle before putting them in a vase. Keep flowers away from ripening fruits, which emit ethylene gas, the ripening/ageing hormone. It will cause flowers to open and then wilt more quickly. Flowers do not like to drafts. Place your flowers away from any heat source and out of direct sunlight, it encourages the blooms to open faster. This, of course, will shorten their vase life. If you really want to pamper your flowers and enjoy them for as long as possible, change the vase water every few days. 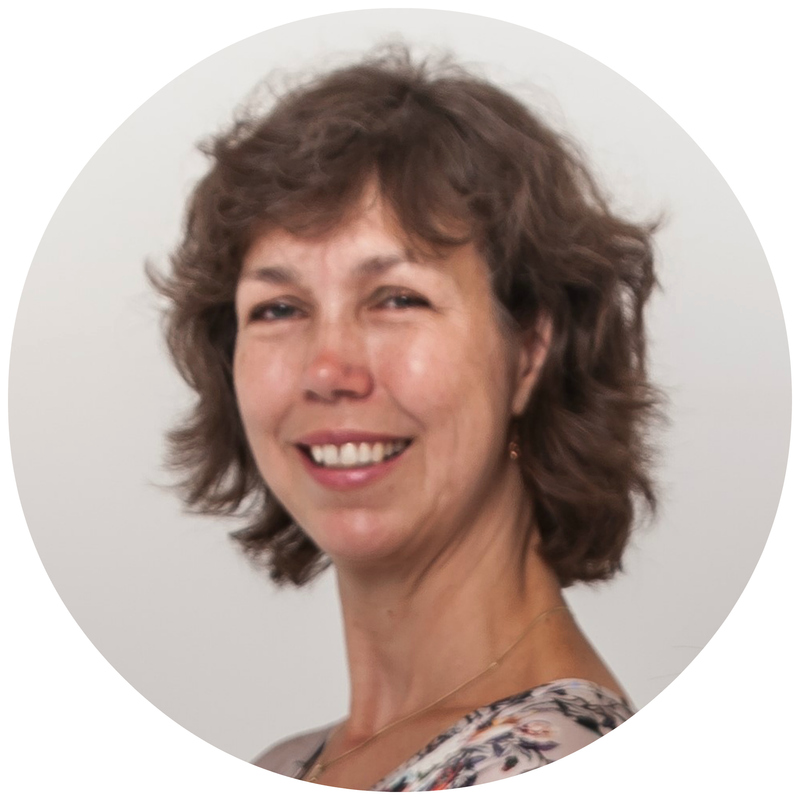 Pauline: Thank you so much for doing this interview with me! And thanks for a wonderful lunch and the bucket full of dahlias. I hope to visit your family flower farm again next year. Until then we will stay in touch on Instagram. 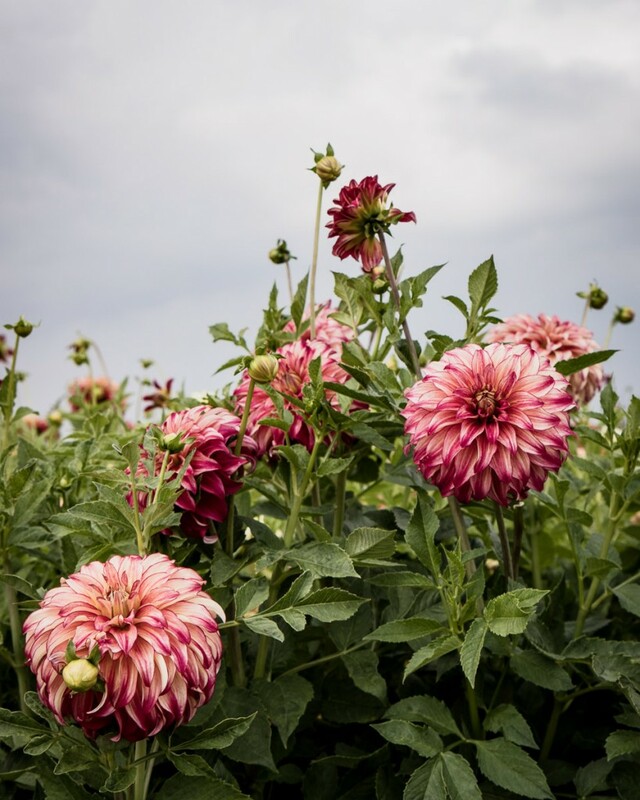 Readers in need of dahlia tubers, you can order them directly from the FAM Flower Farm. They sell daffodils and tulips too! Can you explain how, exactly, to take leaf cuttings. Hi Helen, maybe this is helpful?